Fender has introduced the new Squier models for 2012, putting some nice touches on a guitar line that has had less than impressive results in the past. The new and improved line consists of 8 models, each of which has its own special strengths and improvements. The new Avril Lavigne Telecaster boasts a basswood body, an inlay-free, 22 fret rosewood fretboard, and a maple neck. As far as horsepower, it only includes a single standard humbucker, and a single volume knob. Cosmetically however, it seems quite fetching, with a 3-ply pickguard, all black hardware, and a crafty skull and crossbones image at the 12th fret. This axe seems nice, though for its $479.99 price tag, quality and tone may be taking a backseat to brand name. 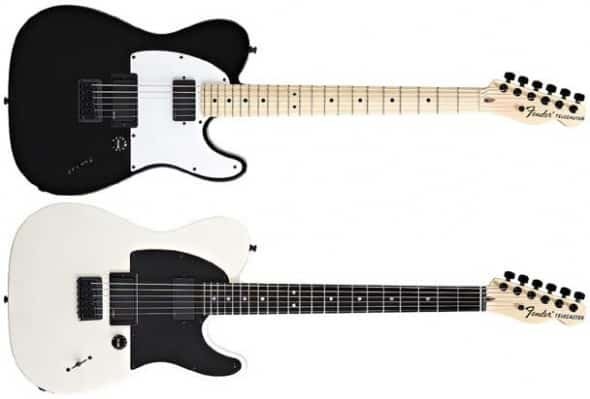 The Jim Root Telecaster is similar to the Avril Lavigne in many ways, starting with its maple neck, rosewood fretboard, and all black die-cast hardware. 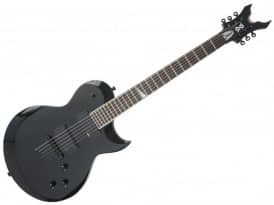 Unlike the previously mentioned guitar however, the Jim Root features a much sturdier mahagony body, and two humbuckers, with black covers, making for a very dark looking metal machine, aimed at speed demons of the highest caliber. Its white pickguard and parchment inlays make for a very striking contrast with the black on the rest of the guitar. 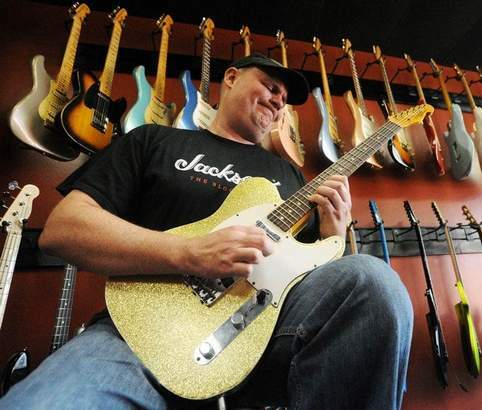 The Jim Root Telecaster retails for about 600 bucks, which again may be a hair on the side of name marketing. Next on the list is the artist designed Mikey Way Mustang Bass, designed with the input from Mikey Way, of My Chemical Romance fame. The Mustang seen here is not too far of a stretch from a standard Mustang bass, its accomplishments lying mostly within cosmetic details. This short scale bass offers a 19-fret rosewood fretboard on a maple neck, with a covered black humbucker pickup. The icing on this cake is the black racing stripes, which rest nicely on top of the silver sparkle finish. You can pick up one of these at the moderate price of $499.99. The other major section of new guitars from Squier is the “new” Vintage Modified Series, which includes 5 “new” spins on the old favorites of yesteryear. First up is the Vintage Modified 70’s Stratocaster. If you’ve been waiting for this article to discuss the exciting stuff, wait no longer. The new take on this old relic is something to be seen—and heard. The Vintage 70’s will bring up so many memories of the old Strats from way back when—you remember, those old off-white Strats with the enlarged headstocks. Yeah, they’re back. Available in black or Vintage White, the new Vintage Modified comes standard with three single coil pickups, a volume control, and two tone controls. Along with these old staples, these also include a basswood body, with a 22 fret ebony fretboard, with a maple neck. And with a MSRP of $399.99, who could ask for more? The Vintage Modified Telecaster Special immediately gives off sort of a “Keith Richards meets Bruce Springsteen” vibe. Available in White Blonde or Butterscotch Blonde finish, this Telecaster reeks of old time rock and roll. Not much is necessarily new or different here, but it really brings out that old vintage Tele look in a nice, affordable package. This Telecaster delivers many of the retro fittings, such as the classic Tele three barrel bridge, a master volume and tone, and a three-position blade switch. One feature that isn’t so old though, is the JazzMaster alnico neck pickup, crafted for all those nasty blues bends you’ve been dying for. A 21 fret maple neck and fretboard look just plain awesome attached to the basswood body. This $499.99 guitar is guaranteed to make Jack jump and start you up. Here we can take a look at the Vintage Modified Surf Stratocaster, which comes complete with vintage style hardware, chrome vintage tuners, and lipstick pickups as well. It’s similar to the rest of the new Vintage Modified clan, with a basswood body, a maple neck, and a rosewood fretboard, though it is available in many other hot colors, such as Candy Apple Red, Surf Green, and Sonic Blue. With an S-S-S configuration, and the white numbered volume and tone controls, this will whip you down memory lane and have you soaking wet in no time. MSRP: $499.99. There aren’t many surprises in stock with the Vintage Modified Stratocaster HSS, but I wouldn’t count it out just yet. This axe is basically a re-issue of the old CBS Strats from the seventies, with a roaring humbucker at the bridge. 21 frets, a basswood body, and a maple neck all continue in the same trend as the previously discussed guitars, and it also is equipped with a vintage style synchronized tremolo, and of course, the everlasting two volume, two tone controls, with a 5-way blade pickup switch. The Vintage Modified Stratocaster HSS is available in cool black, charcoal frost metallic, or 3-tone sunburst. MSRP: $399.99. So what can we expect from this new line of Squiers? No one really knows. But here’s a fact: It’s nice to see a guitar brand start to put out some more genuine axes, a far cry from its standard line of guitars.